Thanksgiving weekend will have passed by next Tuesday, but that doesn't mean it's too late to provide local veterans and their families a show of gratitude. The Crook County Veteran Services Department is once again hosting its Veterans Appreciation Dinner on Tuesday evening at Carey Foster Hall. The event starts at 4:30 p.m., lasts until 7, and people are welcome to drop in whenever it is convenient. All military and veterans are invited to the free traditional Thanksgiving meal, said Shannon Dearth, who is the executive director of the Veteran Services Department, and so are their spouses and other family members. The idea originated at some point last year when Dearth's wife was chatting with a checker at Bi-Mart. He said the two of them talked about the local veteran population, and the checker mentioned that it would be nice if the community could provide a dinner. The conversation made it back to Dearth's ears, and he liked the idea. "It was like, you know, that's a good idea," he said. "I went a little bit further, too, thinking about all of the veterans who don't have the ability to get home to see family and those who are by themselves this season." Dearth wanted to see them come together as a brotherhood or sisterhood form of military and spend some time with each other. The first event, held shortly after Thanksgiving last year, was a resounding success. 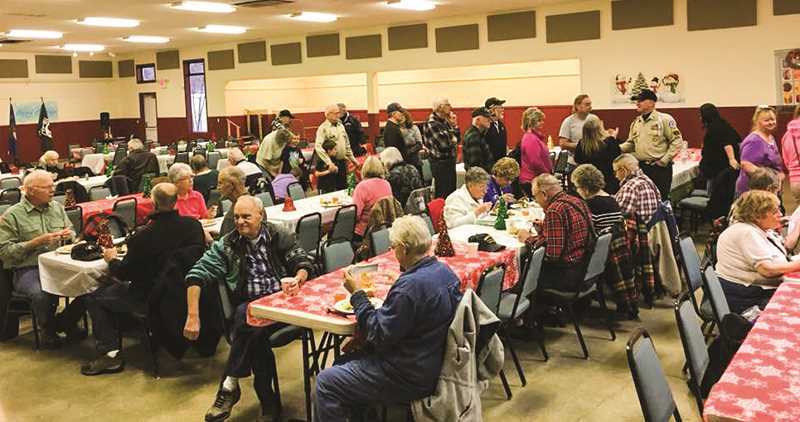 Dearth said about 200 people showed up for the event, and he was heartened by "the overwhelming support we received from the community and the veterans who showed up and seeing the smiles on everyone's faces and everyone interacting with each other." Helping with the effort was the Crook County Health Department staff, who assisted veterans who had difficulties with getting around or filling their plates. "The Health Department was phenomenal," Dearth gushed. In addition, the three members of the Crook County Court helped serve the food. Both groups will participate in the event again this year, but veterans and their families can also expect to see some new additions to the second-year event. "I have got a few different resource tables there," Dearth said, noting that NeighborImpact is scheduled to appear as well as the Patriot Pin-up, a regional nonprofit that assists veterans, and the local health department. "I am trying to work on a few others, but don't have any confirmation yet." Dearth once again picked a date shortly after Thanksgiving to host the dinner. This enables veterans and their families to return to town from holiday trips, and hosting between Thanksgiving and Christmas helps tie in the event with the whole holiday season. "It's just our way of saying thank you to military, the veterans and their families," he said of the dinner. "We are all in this together — one team, one fight."